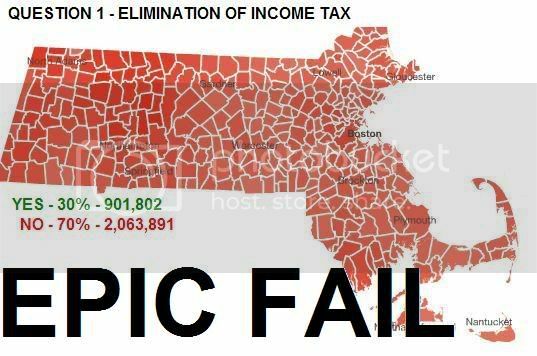 The campaign to end the state income tax was dealt a crushing defeat on Election Day when it was rejected by over 70% of the electorate. It was a kamikaze mission from the start and it was shot down before establishing visual contact with the target. As soon as serious opposition appeared in the form of the Coalition for Our Communities it was over. The left-wing political networks in this state mobilized in an astounding fashion raising millions of dollars and hundreds, perhaps thousands, of volunteers. Leftist activist groups like ACORN and Neighbor-to-Neighbor conducted a massive outreach campaign to urban communities. Government employee unions were calling thousands of voters. Community groups were organizing meetings and lining up to oppose Question One. The lefties were quickly joined by the state establishment. Although more hacky than lefty, the poorly named Massachusetts Taxpayers Foundation published a report that predicted “devastating consequences.” Almost every major newspaper in the Commonwealth opposed Question One and every major political figure cried that it was reckless. The Coalition for Our Communities saturated the airwaves with terrifying ads depicting a world without government services and rising property taxes. They could have relied on media ads alone but they went even further: phone banking, canvassing, stand outs, regional directors, and several direct mailings. The Coalition didn’t want to just defeat Question One they wanted to blow it out of the water. The Committee for Small Government challenged the entire state establishment and lost. The devastating loss can be attributed to an inferior organization, economic trouble, one serious political ally, and a lack of funds but. (The OBAMA! effect did not help either.) There was simply no way for CSG to seriously compete with the massive operation that the unions created. Timing is very important, too. The financial melt down probably hurt Question One more than it helped and the Dianne Wilkerson scandal broke too late. Concerns about graft and scandal were replaced by concerns about emergency budget cuts. Even the best campaign would not have been able to compete with their organization, an excited Democrat base, and a financial meltdown. It just wasn’t our year. But hey it was fun, right? Next: Is a Two-Time Loser a Good Investment?